This is a brand new, genuine Alfa Romeo power steering rack to fit the following. Alfa Romeo 916 GTV 3.0 V6. Suitable for right hand drive versions only. Complete with Track rod ends. Alfa Romeo Part number: 60618478. 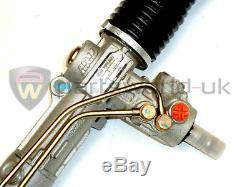 Alfa Romeo 916 GTV 3.0 V6 24v Power Steering Rack & TRE. All deliveries must be signed for (except items sent by standard post). Please make sure you keep the receipt enclosed with your goods. Claims for missing items can be made after 21 days. PLEASE NOTE: This is not a guaranteed next day service. Claims for missing items can be made after 30 days. Items are tracked up to leaving the UK and being passed to your national postal provider who will then provide the tracking service. Courier (24 hour, 48 hour & 3-5 day). We do not deliver to Post Office P. Partsworld-UK shall have no liability to you for any failure to deliver goods you have ordered or any delay in doing so or for any damage or defect to goods delivered that is caused by any event or circumstance beyond its reasonable control. The item "Alfa Romeo 916 GTV 3.0 V6 24v Power Steering Rack & TRE. New & Genuine 60618478" is in sale since Thursday, April 12, 2018. This item is in the category "Vehicle Parts & Accessories\Car Parts\Suspension & Steering\Steering Racks & Boxes". The seller is "partsworld-uk" and is located in Chesterfield. This item can be shipped to United Kingdom.